Travel around the world and learn more about a one-of-a-kind animal, as Lynn Sherr presents a beguiling portrait of giraffes. Lynn Sherr, the award-winning correspondent for ABC TV’s 20/20 newsmagazine, went to Africa for the first time in 1973 and fell in love — with giraffes. “They were a dazzling, unexpected revelation: gawky, graceful anomalies; cool, gentle giants dressed in golden, stained-glass coats. And when they ran, they seemed to float. I was hooked.” Journey to Kenya and South Africa, and to an American zoo that is the giraffe breeding capital of the Western Hemisphere, for a revealing look at this powerful, captivating creature when Ms. Sherr hosts Tall Blondes. Ms. Sherr, a statuesque woman with fair hair and skin, says her friends were puzzled by her choice of favorite African mammal. But, one, nodding wisely, exclaimed, “Of course. Tall blondes.” Her friend’s comment inspired the title of her book, Tall Blondes, upon which the documentary is loosely based. Ms. Sherr re-visits Giraffe Manor, outside Nairobi, Kenya, a refuge whose inhabitants include a giraffe called Lynn, in her honor. At the Cheyenne Mountain Zoo in Colorado Springs, viewers witness the birth of a giraffe, which enters the world six feet above ground. 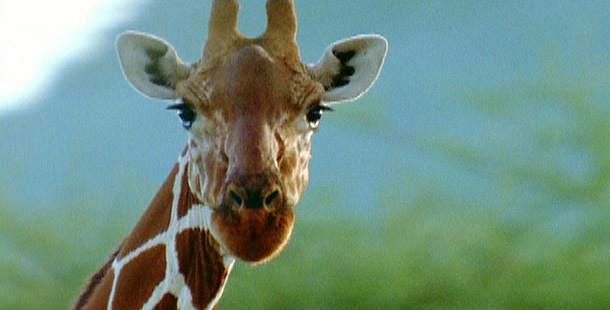 The film’s most exciting sequence involves trapping giraffes and relocating them to an African wildlife refuge. As Ms. Sherr notes, giraffes are not on any lists of endangered animals, but their habitats are shrinking as a result of human encroachment. The program helps debunk the notion that giraffes are silent by highlighting research indicating that they communicate through infrasound, not audible to the human ear.